We're always working hard to improve our video editor and ensure it runs smoothly regardless of what computer you're using. However there are a few things you can do to help avoid errors and slow processing, and ensure your editing experience is the best it can be. Create works in the Google Chrome internet browser (which you can download for free here). Chrome's browser technology allows us to provide the fastest and smoothest performance. Always updating to the latest version of Chrome is important. 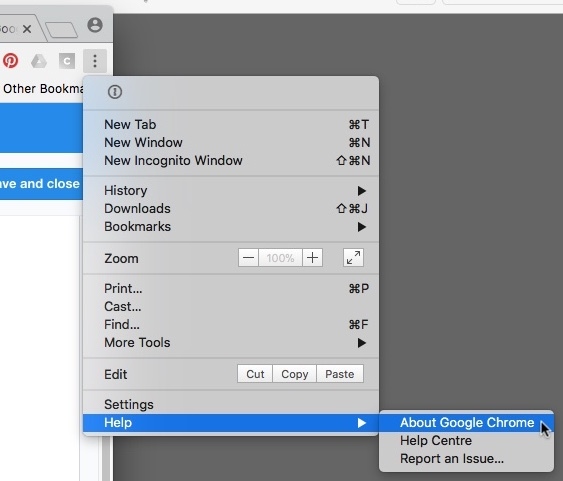 To check your version is up to date, go to the right hand menu in Chrome > Help > About Google Chrome. NOTE: if you have already started work on a project, we don't recommend updating or restarting Chrome until you have checked your cookie settings - see step 3 below. This is to prevent you from having to relink files. When you first open a Clipchamp Create project, a popup will appear saying "app.clipchamp.com wants to store files on this device". Clicking "allow" in this popup is necessary for the Create editor to function properly. To learn why, see: Why does Create ask to store files on my device? These settings are to prevent you from losing your Create project data when you quit Chrome. Please make sure that there is enough free space on your computer's internal HDD or SSD, which is required for temporary project files and space during the video processing and exporting phase. The available free space should be more than the size of the video files you're using in your project. To disable Ghostery, click the Ghostery icon in your toolbar and choose "Trust Site". To disable Adblock Plus, click the ABP icon in your toolbar and choose "Disable on this site". Some other extensions can interfere with Create if you have them installed. We've seen cases where the Google Translate or VidIQ extensions have caused problems with importing media or exporting your finished project. To disable these extensions, open a new browser tab and go to chrome://extensions/. Uncheck the "Enabled" box next to these extensions. Once they are disabled, reload the Create project page. Unlike other online editors, Create does not rely on the uploading and downloading of large files, making it less dependent on internet speeds. However, Create still requires an active internet connection to function and to save your progress. For best performance, and to avoid losing changes to your project, ensure you have a stable internet connection when using Create. There are situations where the Create editor might ask you to relink the video, audio and image files you used in your project. If you delete, rename, or move these source files on your computer, it could cause problems when you reopen your project, so be sure to keep them. This is an optional step if you're experiencing lag after adding videos, image or audio files to an editing project. Larger and longer files can take more time to get processed before they're available to be used, in addition adding multiple media files at once can also increase processing times. If you're using 4K video for instance, it can help to compress these files to 1080p first (e.g. at https://util.clipchamp.com) before using them in an editing project. Your computer needs to satisfy some requirements to ensure Create works as expected. Your available memory/RAM should be at least 4 GB and your machine should be a 64-Bit computer running a 64-bit OS and the 64-bit version of Chrome. If you're working with an older computer that doesn't meet these requirements, the editor may still work, but be aware that you could encounter problems, and would likely have a better experience on a different computer.